Do you have lots of treats at your house? We sure do! 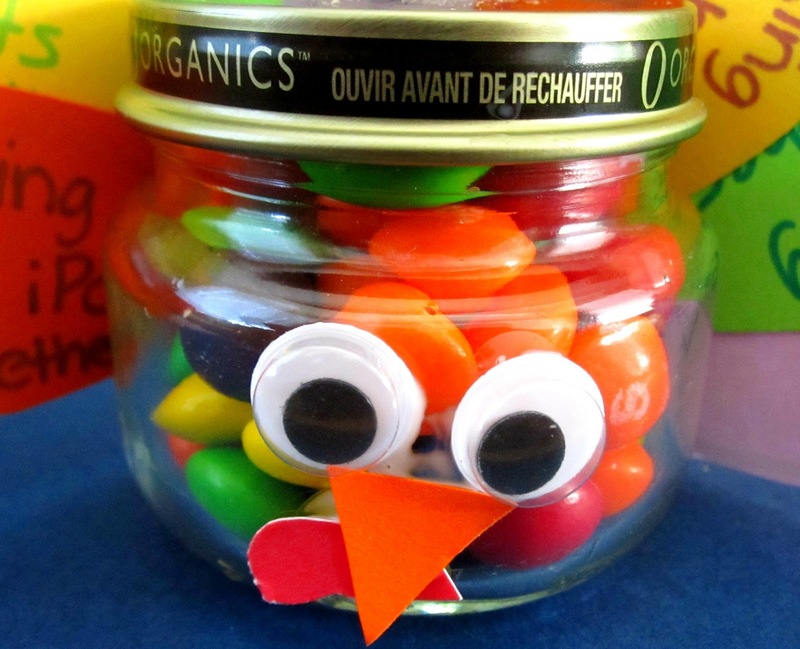 So instead of eating them all ourselves, we decided to share some of our candy and make gratitude turkey treat jars! 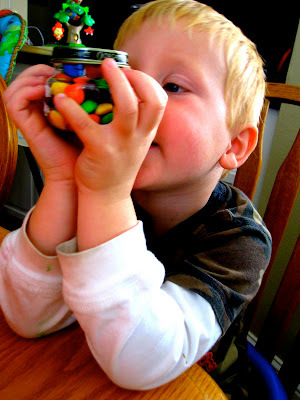 I have loads of cleaned out baby food jars, so I love a good craft project that requires jars! I found this idea at Kids and Glitter and tweaked it a bit to help start our month off right and focus on gratitude! Materials Needed: glue, candy, jars with lids, colored cardstock, scissors, markers, and googly eyes. 1. 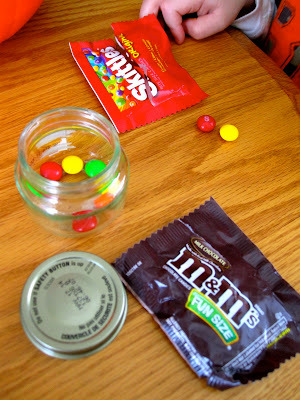 Grab your leftover Halloween candy and try and figure out what would fit perfectly inside a baby food jar. It took my son a few minutes of trying to cram crunch bars inside to realize that small round treats work the best. 2. Fill up your jar with treats. 3. Draw some feathers. I drew these. Next time around I'll have my little guy draw them. His would probably be neater! 4. Cut out the feathers! 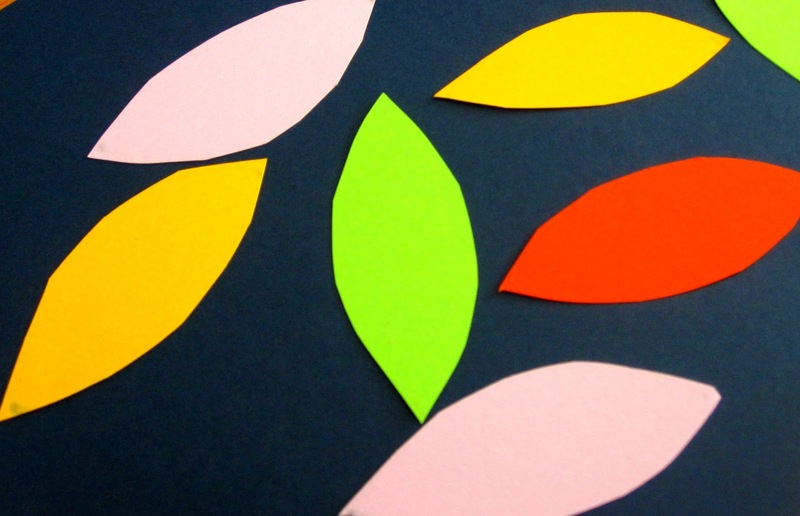 This is a good scissor skills activity for little ones. My son was more interested in the candy than cutting today, so I'll have him cut when we make our next jar. 5. Make sure that jar is FULL and the lid is on tight! 6. Brainstorm who you want to give your jar to and your favorite things to do with that person (or why you are grateful for that person). The second option was a bit too abstract for my son, so the concrete "favorite things to do" got him going. We took turns coming up with ideas and I wrote them on the feathers. He wanted to give his jar to his dad. 7. 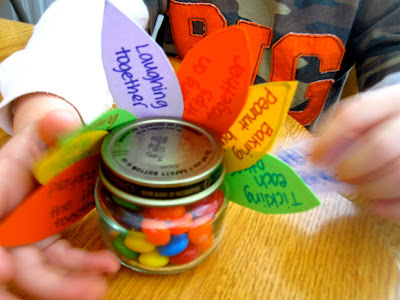 Add some double stick tape to the back of the jar and start sticking the feathers on. The main instruction I gave to my son was that the words needed to face me. We also rearranged the feathers a bit if there were too many on one side. I thought he did a nice job. The tape made it pretty easy. 8. Use some glue and add on a beak, googly eyes, and a gobbler. Then let everything dry. 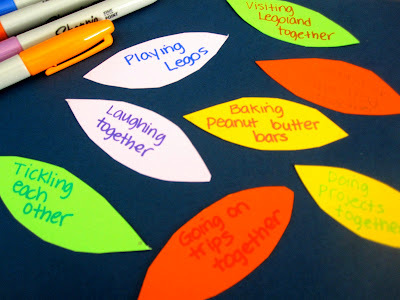 9. Review all of the things that you wrote on the feathers together and then deliver your treat turkey! My little guy loved going through each feather and telling his dad about the ones that he helped come up with versus the ones that were my ideas. By prepping him ahead of time before he gave the turkey to his dad, he was better able to remember all of his ideas and felt really proud that he could "read' them to his dad. 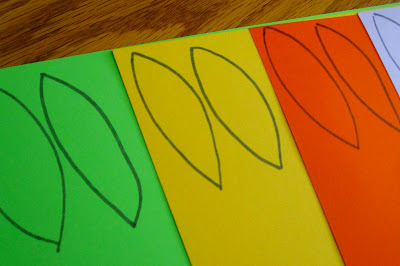 We also worked on beginning sounds as we wrote the phrases on the feathers. He liked telling me what letter was at the beginning of each word. We will definitely be making more of these! They were really simple, fun to make, and a great activity to allow my son and I to talk about people we are grateful for! Oh my, that is perfectly cute! Love how it looks fab, is great to be thankful and probably tastes great too! 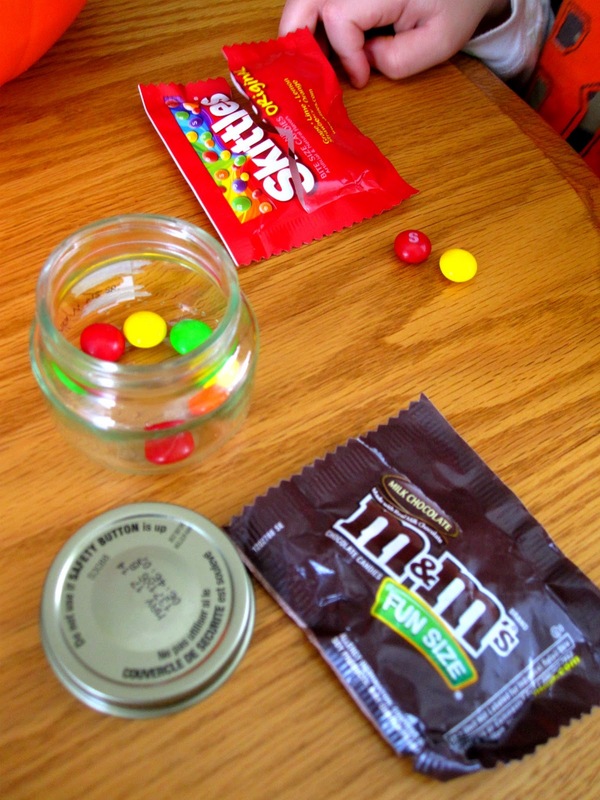 This is such a cute idea and clever way to use the candy! LOVE this!!!!!!! Thank you so much for sharing. I has been thinking of doing something similar with foam feathers and painting the jar brown..LOVE! So cute! 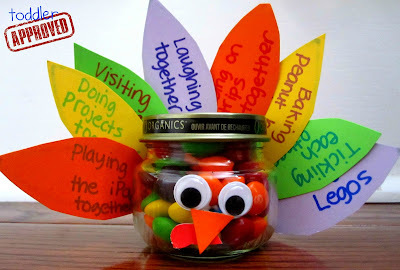 Perfect idea for leftover candy and Thanksgiving! This is such a cute idea LOVE It. Beth- I'll head over to your linky. Thanks for stopping by! So cute...what a great idea!!! Stopping by from the Sunday Showcase. Adorable! What a great idea- I love that he enjoyed telling his dad about it and "reading" all the feathers out. That is a brilliant idea, my children would love it! Wow! You guys are way too nice. Thanks for all the positive feedback. I am making more. These are really a lot of fun! What kind of glue did you use? This looks like a wonderful craft! @ TheRealCandiceJ- Thanks so much! We used Elmer's glue for the eyes/beak/gobbler and then I used double-sided tape for the feathers. This would be great to give to someone to fill out on Thanksgiving! love this! The grateful feathers won me over even more! Super cute idea; I'll have to try! This is such a cute idea! 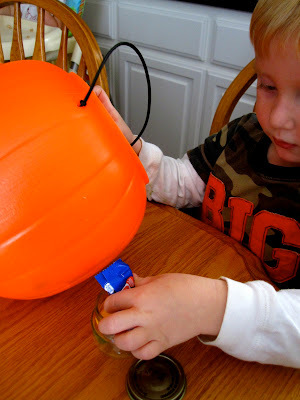 Adding to my Halloween tips roundup today! Oh my god this is adorable and so colourful, I think my kids would love to make something like this.